Humans survive by constantly recycling iron, a metal that is an essential component of red blood cells, but which is toxic outside of those cells. More than 90 percent of the iron in an adult human's 25 trillion life-sustaining red blood cells is recycled from worn-out cells. Almost 50 years ago scientists first began hypothesizing that our bodies must have a special protein 'container' to safely transport heme -- the form of iron found in living things – during the breakdown and recycling of old red blood cells and other types of heme metabolism. 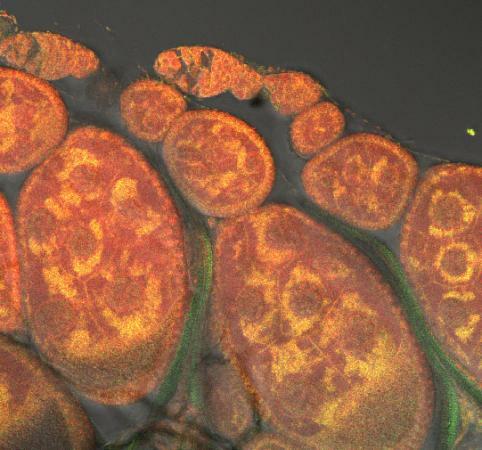 Now a team of scientists from the University of Maryland, Harvard Medical School, the National Institutes of Health and the University of Utah School of Medicine have identified this long-sought heme-iron transporter and shown that it is the same HRG1 protein that a common microscopic worm, C. elegans, uses to transport heme. In humans, the iron in heme is the component that allows hemoglobin in red blood cells to carry the oxygen needed for life. The team's findings are based on studies in human, mouse, zebrafish, and yeast systems, and are published in the February 5, 2013 issue of Cell Metabolism. "Our current work reveals that the long-sought heme transporter that permits humans to recycle over 5 million red blood cells per second in our spleen and liver, is the same HRG1 transporter protein that my students and I discovered in worms in 2008, and which we showed at that time is used by C. elegans to safely carry heme-iron that it obtains from dirt into its intestine," says team leader and corresponding author Dr. Iqbal Hamza, a University of Maryland associate professor in the Department of Animal & Avian Sciences. "Moreover, we show in this current study that mutations in the gene for HRG1 can be a causative agent for genetic disorders of iron metabolism in humans," he says. Plant and animal cells contain two genomes: one in the nucleus and one in the mitochondria. When mutations occur in each, they can become incompatible, leading to disease. To increase understanding of such illnesses, scientists at Brown University and Indiana University have recently traced one example in fruit flies down to the individual errant nucleotides and the mechanism by which the flies become sick. Diseases from a mutation in one genome are complicated enough, but some illnesses arise from errant interactions between two genomes: the DNA in the nucleus and the DNA in the mitochondria. Scientists want to know more about how such genomic disconnects cause disease. In a step in that direction, scientists at Brown University and Indiana University have traced one such incompatibility in fruit flies down to the level of individual nucleotide mutations and describe how the genetic double whammy makes the flies sick. “This has relevance to human disease but it’s also relevant to all organisms because these two genomes are in all animals and all plants,” said Dr. David Rand, professor of biology at Brown and senior author of the study published online on January 31, 2013 in PLOS Genetics. “There are a lot of metabolic diseases that are mitochondrial in origin and they have peculiar genetic tracking — a two-part system needs to be considered.” Five years ago at Brown, Dr. Rand and two postdoctoral researchers — Dr. Colin Meiklejohn, of Brown and Indiana University, and Dr. Kristi Montooth, now an assistant professor at Indiana University — began searching for an example in the convenient testbed of fruit flies.